Figure 1: Empty plate, the meatza was that good. The beige sauce in the small bowl of Figure 1 contained "Sunshine Sauce" which was originally posted on the blog of Melissa Joulwan (The Clothes Make the Girl) and also can be found in her awesome cookbook (Well Fed) with many other delicious recipes I've personally consumed. The only substitutions I made to the recipe were that I did include the optional dash of cayenne pepper, I could only find liquid aminos from Whole Foods, not coconut aminos, and I used "natural" Sunbutter that I found at Target and didn't bother looking for the "organic" one that has no added sugar. The empty space on my plate in Figure 1 was once occupied by the CPK-style Thai chicken meatza. I had found this recipe on the blog called Stuff I Make My Husband. Now, I know Rob isn't my husband yet, which shall be remedied this weekend, but I still make him stuff from time to time and I did SHARE this meatza with him. It should also be noted that both Stuff I Make My Husband and The Clothes Make the Girl are Paleo-diet-friendly websites and usually boast Whole 30-approved recipes. Now, back to the chicken meatza. Some small changes I ended up making to the recipe were as follows: I didn't have any bean sprouts and couldn't find any at Target on my grocery trip, so I omitted that ingredient and just added some extra shredded carrot. I believe the cake pan I used was only a 9" pan, unlike the 10" pan the recipe author used. Finally, since we like things spicy in our apartment, I took the liberty of adding a chopped up jalapeno (seeds included) in with the cilantro and chopped cashews sprinkled on as a finishing touch. I must also mention, the Sunshine Sauce is soooooooooooooooooooooooooo delicious. Amazingly I had some left over from the dinner and decided to use it as a salad dressing for my lunch today (Figure 2). I just mixed up some greens fresh from my CSA (butter lettuce, mustard greens and arugula). Then chopped up and tossed in some celery, carrots and scallions that I had in my fridge (the scallions and carrots were left over from the meatza last night). Then I threw in some breakfast radishes, also from my CSA. Finally, I drizzled on the left over Sunshine Sauce and tossed in 2 over-easy fried eggs for some protein. Figure 2: Lunch time salad. 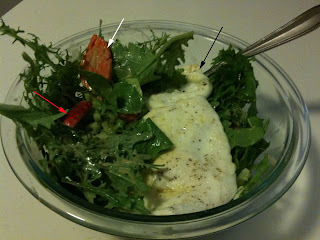 Red arrow indicates breakfast radish, white arrow indicates carrot drenched in Sunshine Sauce, black arrow indicates over-easy fried eggs. That's all that I have to share for today. I don't think I'll be doing much cooking over the next few days as I'm off to get married this weekend. I'll try to whip up something tasty to share next week though. Thanks for stopping by!